A clean, crisp modern booth design by Wellborn Cabinet for KBIS 2017 featured a Grothouse custom crafted Walnut Wood Half Pastore Table. About the Design: Creativity was used to balance the design of this vignette, establishing a modernistic masterpiece. 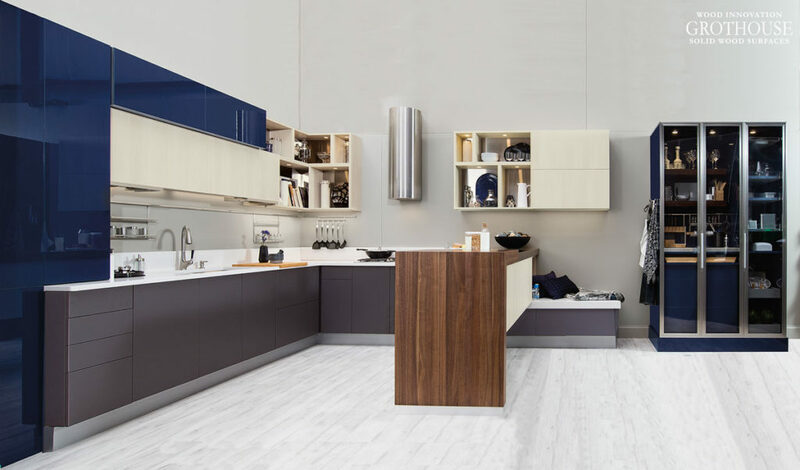 Parallel in design between the top upper cabinets and the wooden section of the peninsula, there is a continuous line across the top of the cabinetry corresponding with the stainless-steel bar running laterally along the way. This cutting-edge kitchen is stylish, yet functional in nature. Making a peninsula, the Pastore™ Table is the focal point of this design. 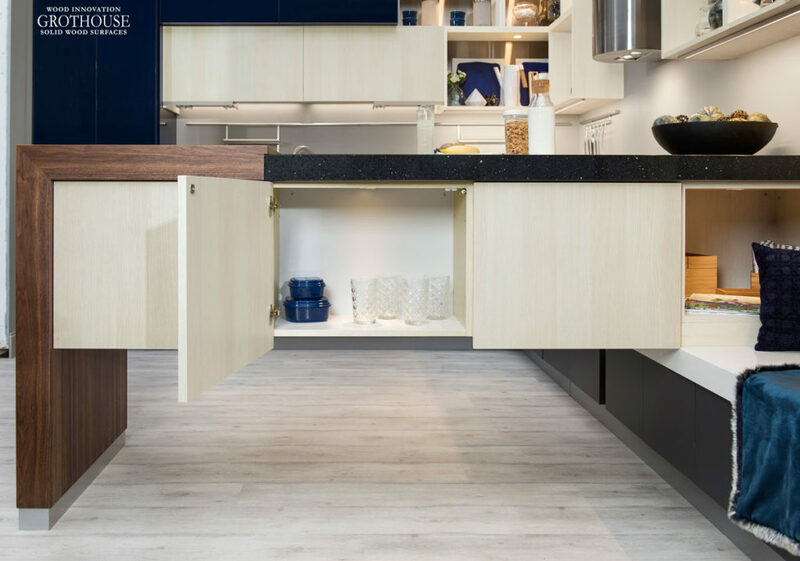 Each side of the peninsula features push to open cabinets to store large pots and pans. The kids’ corner, located on the rear of the piece, creates a play area low to the ground for children to enjoy. 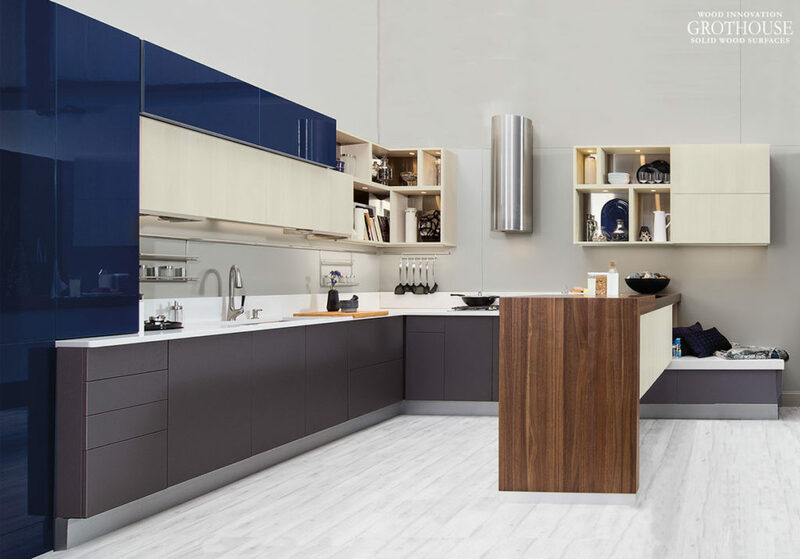 Click here to learn more about the Wellborn Cabinet display at KBIS 2017. To see more designs by Wellborn Cabinet, visit their website, Facebook, Houzz, Instagram, Pinterest, LinkedIn, Google Plus and Twitter. See other designs featuring a custom wood Half Pastore Table in the Grothouse Countertop Image Library. This entry was posted in custom wood countertops, Custom Wood Tables, Pastore Waterfall Countertops and Tables, Wood Table and tagged custom wood countertops, Interior Decorating Wood Countertops, pastore countertops, pastore table, waterfall countertops, wood table by Denise Grothouse. Bookmark the permalink.